Apr 2 Happy International Children's Book Day! Oh I SO love April 2 as every year we celebrate International Children's Book Day to inspire a love of reading. Why April 2 you may ask? It's Hans Christian Andersen's birthday so how appropriate is to have a day like today to celebrate children's books. For this wonderful day let me share with you a couple of books I've discovered, enjoyed and loved lately! I recently discovered this fabulous book about Gloria Steinem and I was delighted to see how accessible is the writing for children but also how inspiring her story truly is. I love the way this book narrates Gloria's life as an activist and a leader. Children would totally understand what it means to stand up and look for better choices. The illustrations are beautifully created and matches the serene tone of the book! I'm sure you can understand this feeling of excitement when your local library sends you an email ( or text!) letting you know that your book reservations are ready for pick up. On those days, I know I can easily come back home with a pile of 5 to 7 picture books! Talk about a perfect afternoon. A perfect afternoon is when I can lay on my carpet all the books I bring home and enjoy a cup of coffee as I make my way through them. From this pile, all were great discoveries but some of my favorite include: Voices from the Underground Railroad, They Say Blue and Libba. 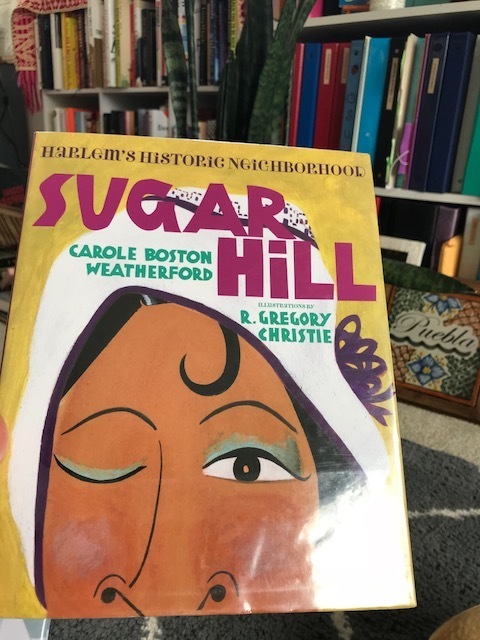 Sugar Hill: Harlem's Historic Neighborhood by Carole Boston Weatherford and illustrated by R. Gregory Christie is a wonderful celebration of a neighborhood that was home to so many brilliant African Americans in the 1920s. Sugar Hill was a place where everyone could enjoy a life filled with books, culture, art and creativity. This books plays a wonderful tribute to an inspiring neighborhood!